With a fresh dusting of snow yesterday in Chicago, winter is clearly not going anywhere anytime soon. Luckily, we’ve got makeup to keep us reminded of warmer, sunnier days. All it takes is a bright lip to help beat the winter blues, and we’ve been using Nars’ Satin Lip Pencil in Yu to do just that. 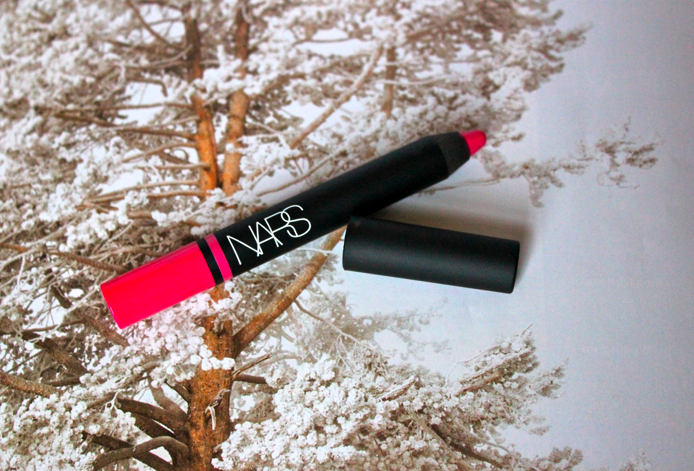 We’ve been obsessed with all things Nars lip pencils since they were first released, but only recently got our hands on this bold pink shade. Since adding it to our ever-growing collection, we’ve noticed just how often we’ve been swiping it on in the morning. The shade not only brightens up your entire face, it also gives your whole look a bit of a cool girl vibe (you clearly made an effort, but the ease of the lip pencil doesn’t look like you’re trying too hard). Pink lipstick can be intimidating – girly, Barbie and flashy are all words that could come to mind at first mention – but fear not, the right color and the right outfit can change all of that. We’ve figured out the right color, now we want to see what you pair it with. Tag us (@thestylisted) in your Instagram photos showcasing your favorite outfit for a bright pink lip and help us survive the rest of winter together.